The all terrain cranes can be configured in many different ways according to the manufacturers. 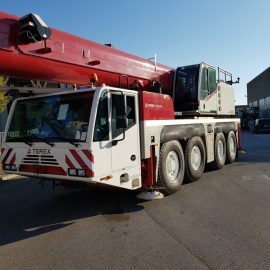 Generally all terrain cranes are versatile and able to operate on any type of terrain, in any condition and in various sectors. They are multi-axle vehicles, double cab (cab and operator’s cab), a rotating turret and hydropneumatic suspension. A tangible example is definitely the range offered by Terex-Demag. The Terex all terrain cranes with capacities from 30 to 1200 metric tons (35 to 1320 U.S. tons) can lift heavy loads over the entire action range. The excellent rust protection obtained thanks to the separate coating of each component and the aluminum coating ensures a long useful life, which also contributes to the welding process, carried out in order to prevent corrosion.